This muffin Monday is brought to you by hazelnuts, brown butter and raspberries. Do you like all of these things? I hope you do because they like you! I had left over hazelnut meal from my previous Hazelnut Apple muffins but have not found a good reason to use it again until today. I used half AP flour and half hazelnut meal in these muffins and the nutty crumbly texture was incredible. I also used browned butter rather than regular old melted butter because brown butter makes everything better this is a fact. I love how the raspberries just melt into the batter when baked. The best part of these muffins is the sugar-crusted tops. Hot out of the oven the sugar tops crack like a crème brulee. 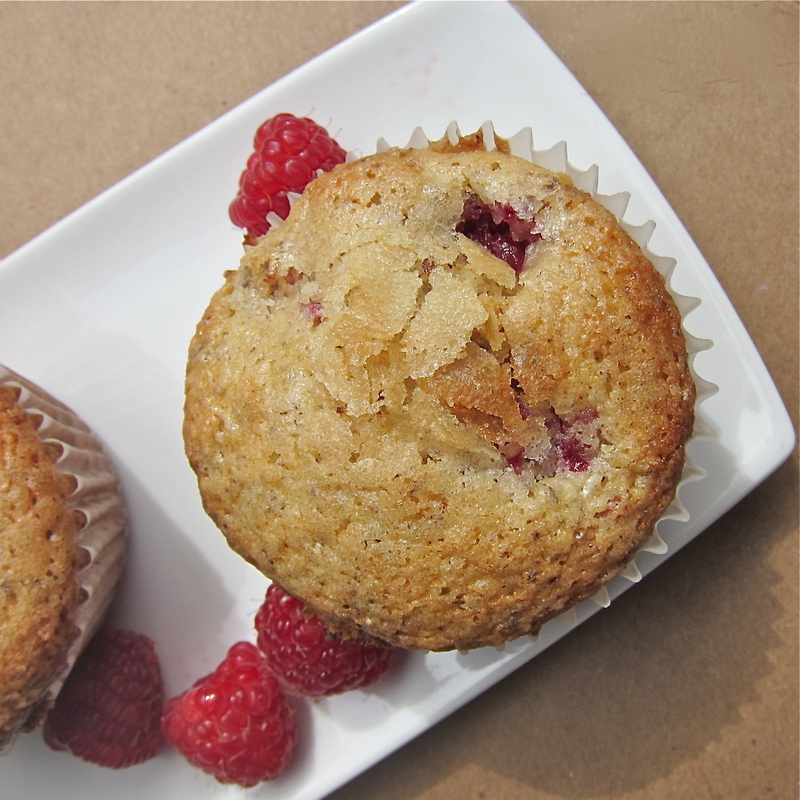 These muffins are sweetness all around with a delicate tartness from the raspberries. I am currently enjoying this beautiful spring morning eating these nutty, buttery muffins with a cup of tea while watching the newly hatched doves in my back yard. Muffins in the morning… the only way to start the day! Heat oven to 400° F. Line a 12-cup muffin tin with paper liners. In a medium bowl, combine 3/4 cups of the flour, 1 cup of hazelnut meal, 1/2 cup of the sugar, the baking powder, and salt. Add the brown butter and combine. In a second bowl, whisk together the milk, egg, and vanilla. Gradually add the milk mixture to the flour mixture and stir until just combined; the batter will be lumpy. Toss the berries with the remaining flour in a bowl. Gently fold the berry mixture into the batter. Fill each muffin cup 3/4 full. Sprinkle the batter with the remaining sugar. Bake for 17 to 20 minutes or until a toothpick inserted into the center of a muffin comes out clean. Transfer pan to a wire rack to cool for 10 minutes. Serve warm. Oh my goodness! I LOOOOVE adding brown butter to baked goods. Fantastic spin on this week’s recipe! Brown butter makes everything better. Everything. Take those pesky rasberries out and I’m IN! Um… brown butter layer cake? Hello? Hazelnuts, brown butter and raspberries? Yes, please. I am very curious about the texture of these half nut meal and half flour muffins. Ooh! I did think of using almond flour and then sickness got in the way and I just did a quick whip of anything that came in front of me. Lol. I looove the description of the crackly tops on these! So happy it’s spring and berry season is upon us! Am definitely going to bookmark this one! Yum! Brown butter? Hazelnut flour? Raspberries? Crème brûlée type crust? Tea? Doves?! Now that’s the way to start off your Monday 🙂 Love your adaptions. newly hatched doves? ah, so cute! and this sounds like a killer muffin combo! mm, brown butter!